Darlington Cares is a volunteering organisation which brings together a number of the town’s businesses to donate their employees’ time and expertise to improve the community. The organisation delivers its own volunteer projects and offers a broad range of opportunities across three key areas: environment, education and social justice. Harvey & Hugo has provided social media support in kind to Darlington Cares since 2013, but in October 2017, the organisation enlisted the wider services of The Pack to raise awareness of its work. To raise awareness of Darlington Cares among Darlington businesses and community and help increase the number of members, as well as making volunteering a behavioural norm amongst the employees of member organisations. The six-month campaign, running from October 2017 to March 2018, consisted of campaign ideas and themes generation, four press releases, infographics, live event coverage through social media and a Queen social media package. The press releases focussed on: the growth of the organisation; the success of the Pick, Pie and a Pint litter-picking campaign; the Christmas Appeal and a pre-event write-up for the annual volunteering fair. 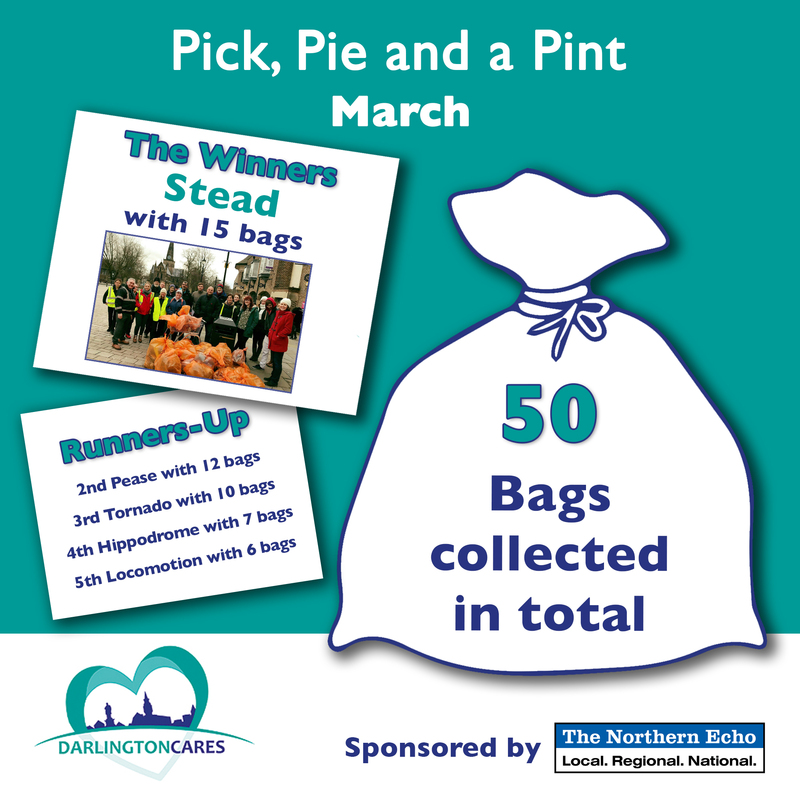 We gamefied the Pick Pie and a Pint event, creating five teams, all with names linked to Darlington, and our designers produced an infographic which is used to promote how many bags of rubbish each team gathers at every event. We used social media to engage with members and the Darlington community, as well as increasing awareness of Darlington Cares and sharing upcoming projects. We also created live event coverage of the volunteering fair. We helped generate campaign ideas and themes, with our designers creating a Care-Ometer to visually show how many hours Darlington Cares’ members have volunteered over a year and a reward scheme for the organisation’s members. Following The Pack’s hard work, it was decided by the Darlington Cares board that Harvey & Hugo had produced some fantastic results, increased the awareness of the organisation and as a result, a 12-month campaign has been established.